If you’ve been following my blog for a while (before my RTW), you will know that I love to eat. I even have a series called the Glutton Series where I recap the best food I had in different countries. Last week, I donned my Glutton cap and joined Florence Food Tour for about 3 hours of non-stop eating (tasting to be exact), walking and learning. The location of the office is rather hard to find, especially when you rely on Google Maps. It’s not at the junction as labelled on Google Maps, but it’s a lot further inside Via dei Cimatori. So do take note. My tour was led by Angelina and there were two couples in the group. The younger couple were from San Diego while the older couple were from Holland. Our first stop was a cafe, a perfect place to start since I needed some battery to power through the morning. Chiaroscuro looked like a regular coffee bar from outside but there are actually seats inside. One very good thing about this cafe is that the Wi-Fi is free and not protected by password. I give this perk an extra 20 points. But we weren’t at Chiaroscuro to use the internet, let me get on with the tour. The owner showed us two types of coffee beans–Arabica and Robusta–and also coffees made from the different beans. I think I prefer the mellower Arabica since Robusta was too powerful. Trivia time! 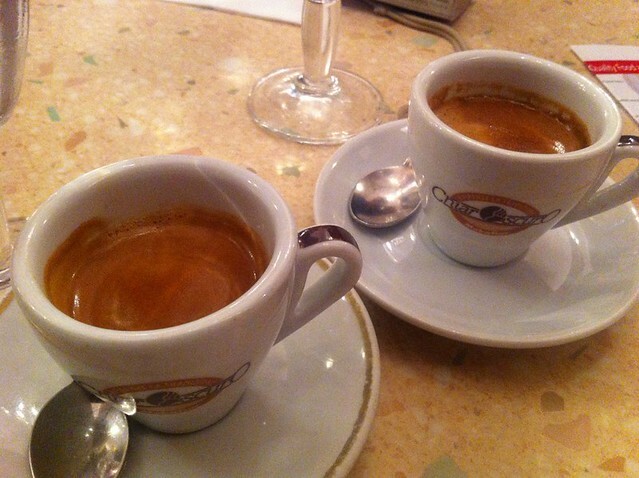 Do you know why Italy is famous for coffee even though other countries (Holland, USA) imported the beans earlier? The owner said it was because the Italians learned how to roast coffee beans well and invented the espresso machines. Next stop was all about truffles. The staff of Procacci Company was still getting ready when we arrived so we hung around outside for a little while. 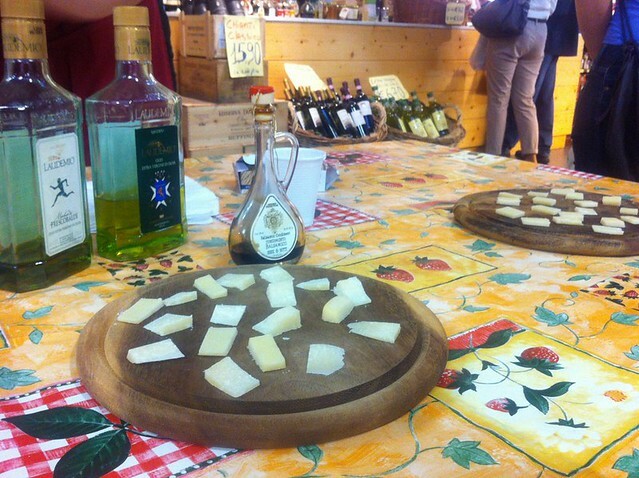 When we were in, we each sampled a small bread with black truffle and soft cheese. There was also a large coffee book about truffles which Angela passed around. Trivia time! Did you know that the truffle pickers used pigs to sniff for truffles since way way back when everyone in the picture dressed like peasants? Now certain types of dogs are trained to pick truffles because the pigs would eat up the truffles too often. 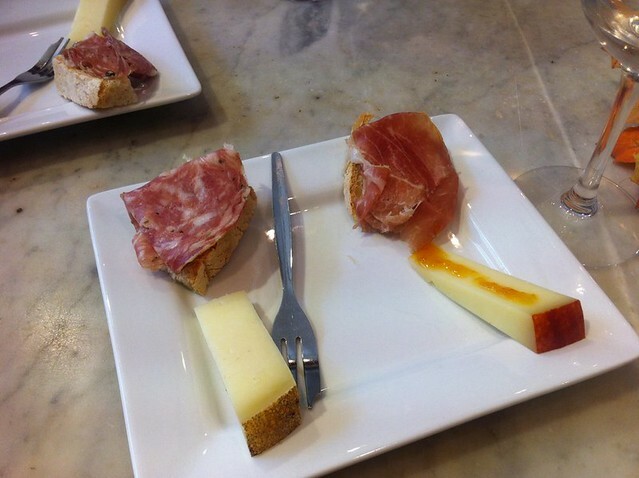 We then headed to La Divina Enoteca near the central market to try out some local wines alongside some nibbles. The shop itself deserves an introduction. Back in the end of the 19th century, the shop sold cod fish and kept the fish in white marble tanks. The tanks are still intact in the shop and now hold yummies such as jams. For our wine tasting, we had a red and a white wine. Being a wine noob, I’ll tell you all about the tidbits that went with the wine. With the white wine, we ate the bread decorated with a lace of salty Tuscan ham and Tuscan cheese made from sheep milk called Pecorino. One of the cheese had a dab of jam, which was oddly matching since the sour/sweet of the jam blends with the cheese. Our Central Market stop was packed with good eats and was a living museum. 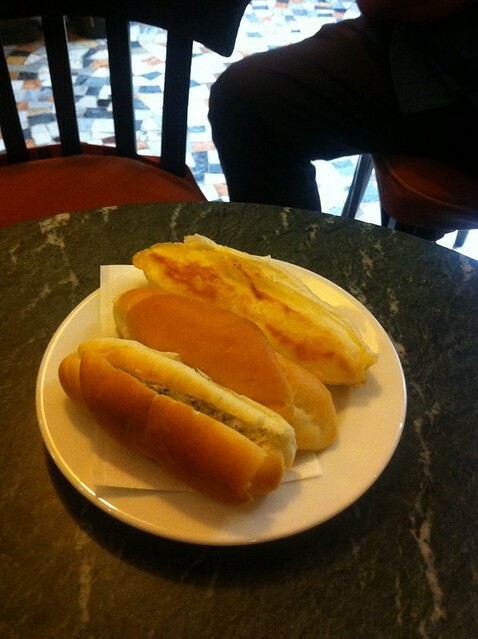 There, we had a taste of Florence’s bread which, to my untrained palate, is a bit less tasty than French baguette (maybe because they don’t use salt). 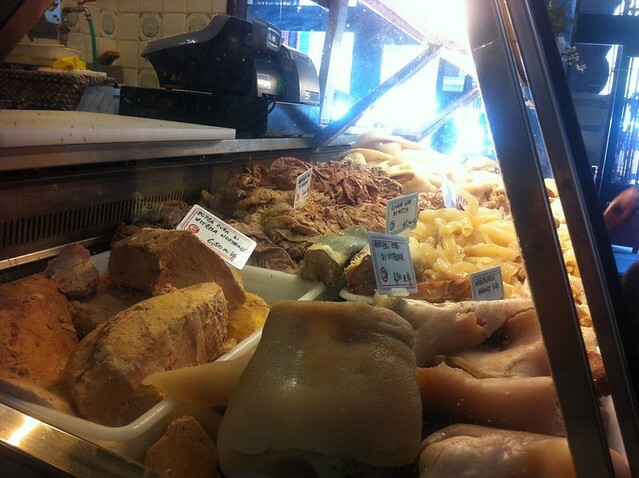 At the market, we had a sit down quick meal of fresh pasta with ragu at Nerbone. The pasta was flat and wide and was curly. The ragu wasn’t dripping off my noodles the way I like it but it was very flavorful with the dash of olive oil. 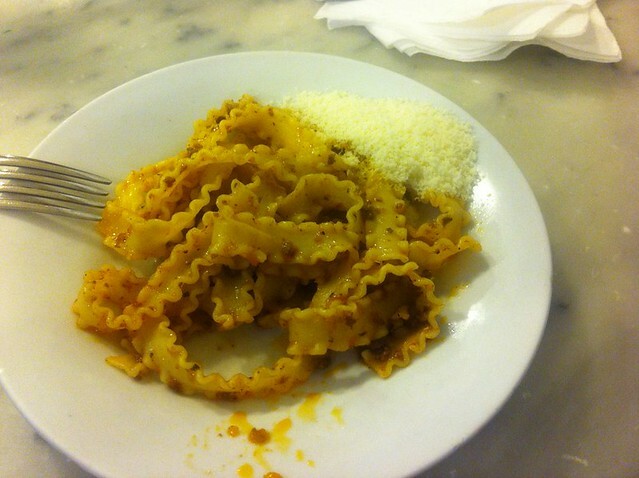 By the time we’ve finished our pasta, our stomach level was approaching 90 percent but we still had two stops to go. 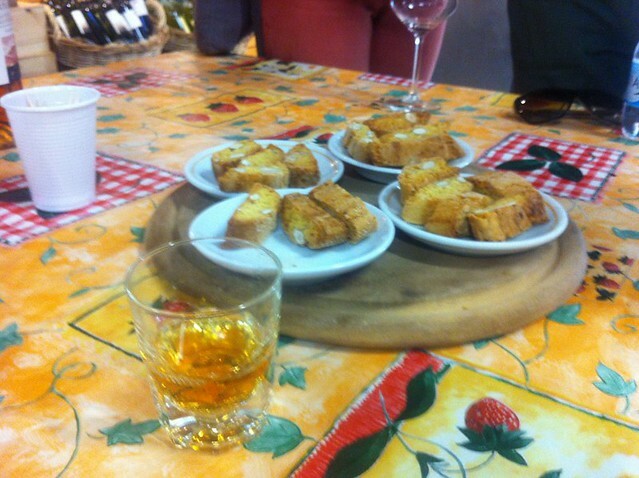 In the market, we stopped at Marconcini for olive oil, balsamic vinegar, ham and Vin Santo with cantuccini. Living in Singapore and Malaysia, the olive oil that I eat usually is slightly rancid because of the time it took to ship and sell the oils as well as the tropical weather. 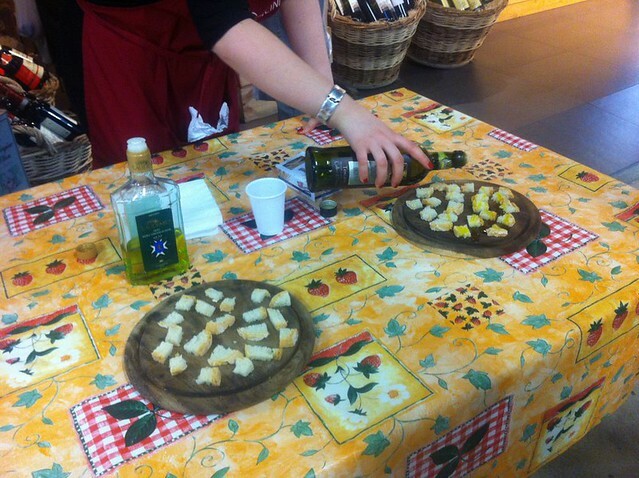 However, there at Marconcini, I tasted an olive oil (drizzled on bread) that had a “green” flavor. I wasn’t a big fan of balsamic vinegar so I don’t have much to comment. However, it was surprising to find that the balsamic vinegar sold there was so thick it looked like thick soy sauce. Our last stop was a gelato place called Antica Gelateria Florentina where they served interesting flavors including matcha. The price here is cheaper than most places with the least expensive costing 1.50 euro. I think this means they are honest people and not out to fleece tourists. I had two of the special flavors: one was called Buontalenti (the name of the person who supposedly invented gelato) and Ambrosia. 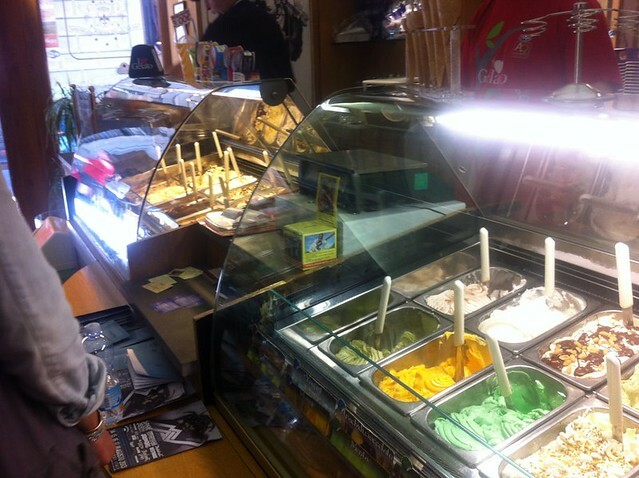 I have to admit that my tongue and stomach were not trained for gelato so most taste the same to me. For the official listing of what foods you will eat (in case it changes), you can check out the list of tasting and the partners. The price of the tour is 59 euro, which is about 17 euro cheaper than one competitor–based on my Googling skill. The quality, quantity of the food and the variety that you can taste makes up for the price. Plus, you won’t need to eat lunch afterwards so you save on a meal. Have you ever been on a food tour? Where was it and how much did you eat?